Sorry I have been MIA for a while. Work caught on pretty well and the fact that I was am on a diet made me stay away from fancy cooking. Although I had tonnes of posts in my drafts, I wasn't in the mood to sit and pen down a whole blog post, edit the pics etc etc and it came to a point where I wasn't even signing into blogger and checking in on my fav bloggers. So if I haven't visited you guys in the near future, it is because of random stuff like this. I hadn't baked in ages, and somehow wasn't even having any withdrawals this time. But yesterday, we had a lil something to celebrate and I fell prey to the husbands nagging for a chocolate cake. Like I have mentioned loads of times before, I actually don't like chocolate that much. And every time Ro bugs me for a choc cake, I bake my moms easy Beat & bake chocolate cake which takes no time and you get the desired effect. Was a bit in the experimenting mood yesterday, but not so much as to spend hours googling and grocery shopping, and so decided to head over to Marias Menu and borrow her recipe this time. Of course it was extremely moist like she said and pretty easy to put together as well. I didn't do the ganache or any frosting, since my love for plain cakes still rule. Even though I have restricted my in take to about one slice, the husband has been gorging on it non stop. 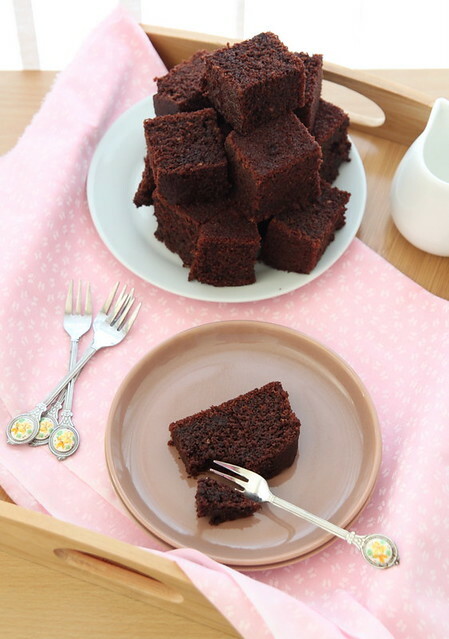 So while I chew on those salads and fruit, you can go ahead and enjoy this yummilicious chocolate cake. Pour into a sauce pan the milk, oil, butter and cocoa powder. Mix together on medium low heat till the butter completely melts. Keep aside to cool, stirring in between. Into a mixing bowl throw in flour, baking powder, baking soda, sugar and salt. Whisk to combine. Add the beaten egg and vanilla extract followed by the wet ingredients. Whisk/ beat well to combine all the ingredients. There shouldn't be any traces of flour visible. The batter would be really loose, but not to worry. Pour into a 9 inch pan lined with baking paper, and place in the middle shelf of an oven pre heated at 180C for 45 to 55 minutes. If making cupcakes, then reduce time to about 15 to 20 minutes. Do the skewer test at around 45 minutes and then continue if required. Take it out of the oven, let it rest for about 10 minutes and then turn it onto a cooling rack and leave it there till it cools down completely. Slice and serve with some vanilla ice cream or store in an air tight container. Notes: I added vanilla extract, because I like the vanilla taste in chocolate cakes. Add self raising flour if you have it and omit the salt and baking powder from above. The texture of the cake speaks thousand words and I know this is one of the nicest chocolate cake recipe. Third pic with the fork looks pretty. Lovely looking chocolate cake. Looks so soft and inviting. lovely recipe. I'm tempted to go make this right now! perfectly baked cake !! looks so soft and tempting clicks !! Very rich & luscious looking chocolate cake..even though I dun love chocolate that much, I wanna grab a piece! Looks like it is busy/lazy time all around.. :) the same here too..
BTW the cake looks great.. Now let me bookmark this as I am in the spree of decorating cakes.. 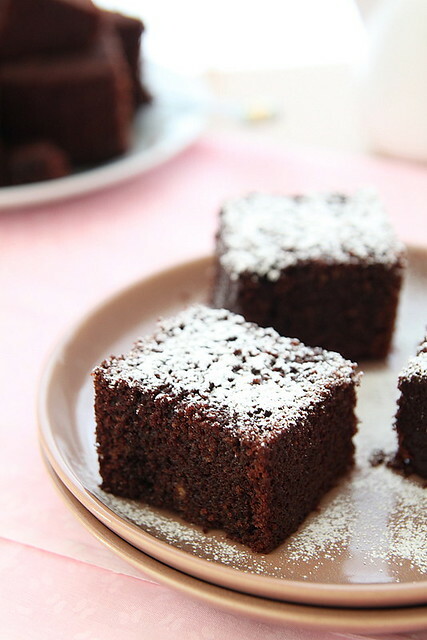 Damn delicious :) I don't mind trying n number of chocolate cake recipes for my chocolate love :)Bookmarked. Wow! This looks like my kind of cake too, no frosting, just the plain delicious cake:D Pity I am on a diet too! That cake does look moist and awesome. I have Friend from Kerala and she makes an amazing chocolate cake. But she won't share the recipe :-D This looks like it! Thanks Nisha for posting it here :) As I said before the pics look awesome! The cake looks absolutely delicious! lovely. i loved ur petite ornated forks too. 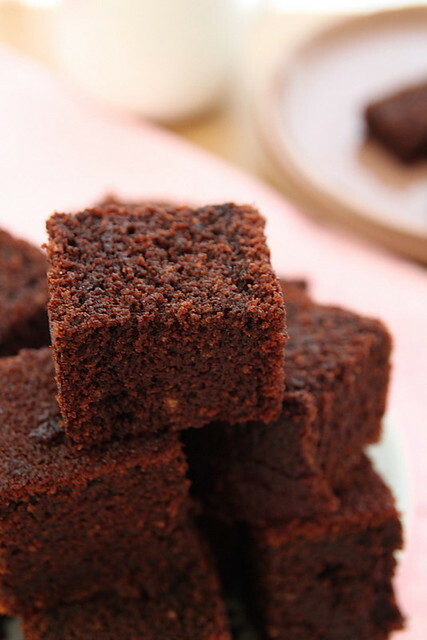 Classic one,super moist and tempting. 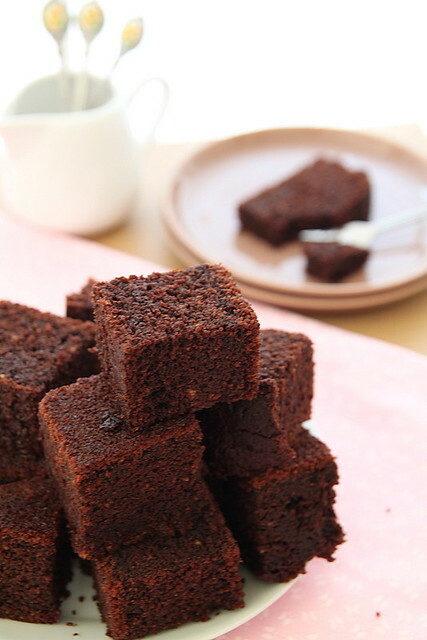 Super delicious & moist chocolate cake!! OMG, amazing dear..wish i could grab one from the pic..lovely recipe..
ooohhhh...they make my toes curl! 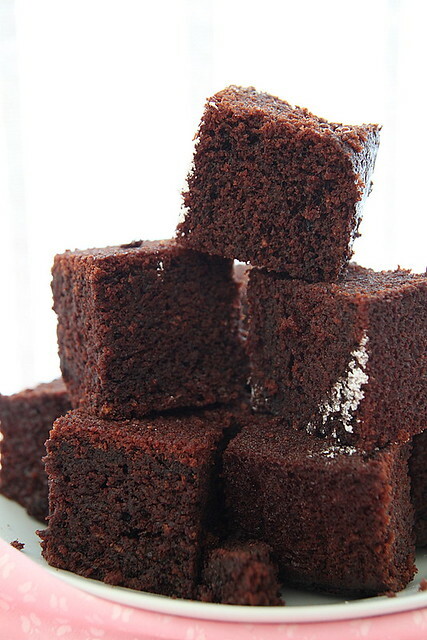 Super moist and super tempting cake squares. Umm umm good and your pictures aren't helping much either! Thanks to you and Maria for sharing/posting the insanely wonderful and tempting chocolate cake! 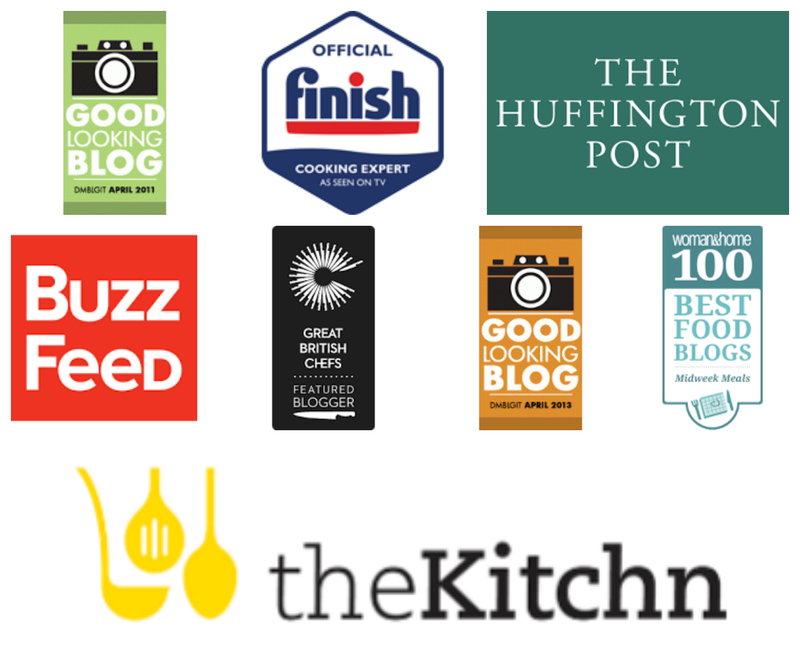 The texture is too good and your clicks say that in every pixel! Lovely clicks and recipe! they look to die for. love chocolate and love cake. Did u say you don't like chocolate ?? I don't think you are weird but my friends think I am cause I don't like chocolate much .. unless I am eating a chocolate like like yours .. plain simple .. moist and zero frosting! wow! i absolutely admire u for resisting this amazing cake! Just feel like grabbing one piece, looks moist and yummy! This chocolate cake looks just about perfect right now. Thank you for sharing with me tonight. Another lovely and delicious post! I hope you have a wonderful start to your week, my friend. Many blessings! Yummmo....chocolate cake looks awesome.... so soft n moist. And perfect squares with amazing photography. Yum yum yum...feel like having these right now.. I too am in love with plain cakes. the whole concept of sugar laden frosting puts me off. And this looks quite moist indeed, so will surely give it a try!! I tried the cake and it turned out really yummy. The only weird thing was that the cake had a somewhat distinct appearance in the middle (long threads). This did not affect its texture or taste, but just wondering why it did that. 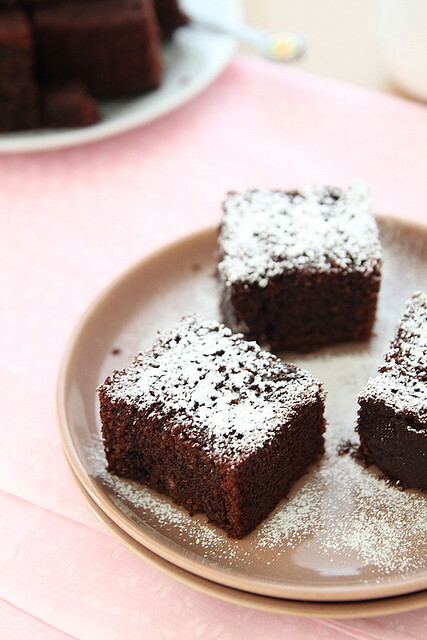 OH my god love those cute fluffy chocolate blocks.. Loving ur pictures.. wish I can grab a piece right from the picture. I can imagine how busy life gets sometime. But this cake looks perfect!